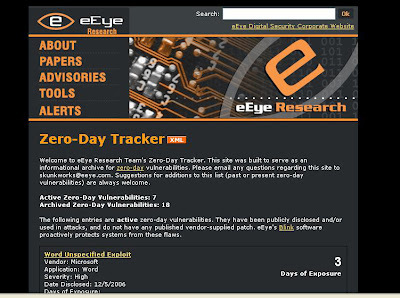 Eeye's Zero day vulnerability tracker. Eeye the Digital Security firm has an online tracker which keeps track of all the Zero day vulnerabilities that are currently unpatched. Right now they have listed 7 zero day vulnerabilities that are active. The list helps you keep track of all the active Zero day vulnerabilities as well as the patched ones. All these active Zero day vulnerabilities are Microsoft related. Also, Eeye's Blink software efficiently protects the user from the vulnerabilities. Home users can download the free version which is without the spyware protection, Windows Server Operating System Support and some other features which is only available with the paid version that costs $ 59.